Give your photo equipment confidence inspiring protection with the B&H Kit that combines a black SKB 20ll-7 Case with Divider Set, Lid Organizer, TSA Lock, and Desiccant Gel. This case has a durable hard plastic exterior that can stand up to the abuse of travel thanks to its crushproof design. An O-ring seal keeps out dust, dirt, and water so your items remain protected regardless of the weather conditions. Features such as a built-in automatic pressure equalization valve, metal locking loops, and a rugged polycarbonate shell ensure reliability. Carry the case with the large fold down handle or roll it over level ground with the telescoping handle and wheels. Arranging gear is easy with the divider kit and lid organizer. The two padlockable hasps will accept the included Ruggard 3-Dial TSA Combination Lock. The Ruggard Desiccant Silica Gel Pack helps protect stored gear from moisture. This gel pack is housed in a reusable metal tin. Store, transport, and protect two cameras, up to seven lenses, and related accessories with the watertight, dustproof, molded SKB iSeries 2011-7 Case with Think Tank Photo Dividers & Lid Organizer. The black case features two trigger latches, two metal-reinforced locking loops for optional padlocks, an automatic ambient pressure-equalization valve, an over-sized top handle and a trolley handle with wheels. Under the lid is an organizer with three zippered clear mesh pockets and a polyester-lined iPad/laptop top-loading pocket. The lid organizer is attached with touch-fastening fabric. The removable padded insert has a variety of touch-fastening, Nylex-wrapped, closed-cell foam partitions, including two 90°-angled dividers and ten regular dividers. High-contrast, gray interior fabric makes it easier to locate gear in low light. 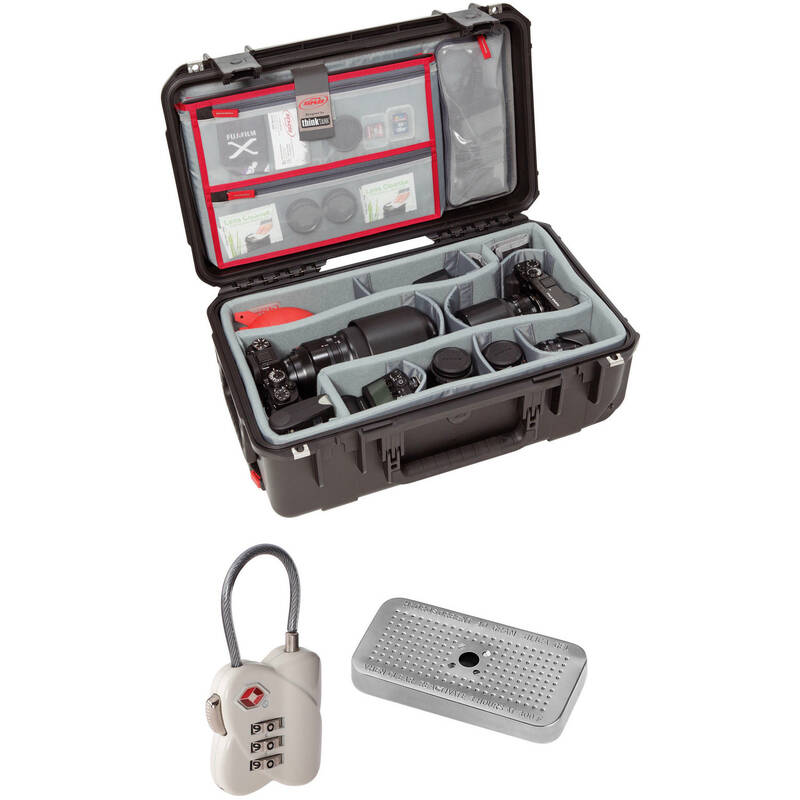 This versatile case may be used with or without the insert and lid organizer. Carry-on size for select airlines. Check with your carrier prior to departure. Box Dimensions (LxWxH) 22.4 x 13.9 x 9.4"
20ll-7 Case with Divider Set, Lid Organizer, TSA Lock, Desiccant Gel (B&H Kit) is rated 4.9 out of 5 by 22. Rated 5 out of 5 by SRZELLI from Absolutely worth buying I was on the fence about purchasing this case. I was between this and the Pelican and I am so glad I went with the SKB. The build quality is fantastic with a wonderful feel. Airtight, waterproof, dust proof and crush proof. This case is my new equipment insurance. I can fit all of my lenses + camera body and all gopro equipment, along with chargers and my 15" MacBook Pro. I can rest easy knowing my equipment is safe and secure. The case is a little heavy, but completely worth it. I bought this case to protect my equipment, not because it was light weight. I would recommend this case 10x out of 10. Rated 5 out of 5 by Jay from Good travel size, easy to manage, built well Carry-on friendly for US, and most international. The padded liner works very well. There are two small incursions into case for the wheels, but it is not a big deal. The bottom liner is easily removable, the top section is attached with hook and loop and takes a bit of work to remove. I suggest pressing the liner into place to set the hook and loop tape before you first use the case. Grab additional dividers from your other bags if you need them to pad or hold down gear. The top liner will hold a MBP 2017/2018, even in a thin sleeve. A fully loaded top section does not extend beyond the top case profile so no closing problems. The zipper mechanism can ding equipment if you are bouncing around a bit (zipper pull aligns over camera body), so move them, place a bit of gaffers tape over the pulls or separate the liner and the bottom section with a donke wrap. The latches are fantastically easy to use-no bruised fingers trying to open them. The top and side handles are big, comfortable and the case balances well. The wheels have enough clearance to get over small debris and they track pretty well even over rough ground. It is waterproof. Makes a useful seat in long lines. Rated 5 out of 5 by Paula from Excellent! I bought an SKB carry-on a few years ago, but really wanted a non-foam, infinitely adjustable interior, as well as the lap-top envelope. ?I am very happy with this iSeries 2011-7-- it easily accommodates my 17" MacBook Pro, Sony a9 and Sony a7riii, 20-70mm, 100-400mm, a Lensbaby 85, a Zeiss 55, as well as some lighting accessories, Lacie external hard drive, various cords, a mouse. ?In other words, tons of room, very well padded, and secure. ?The only improvements I could suggest would be to put 4 wheels on the bottom instead of just 2, and make the handle a bit longer. Rated 5 out of 5 by Darryl from Love it Just what the doctor ordered...Fits 2 canon 5d bodies, 70-200, 17-40, 50mm, 24-105, 100mm, 580exII, 15"mac book pro, zoom H4N, 6 ?batteries for 5d, plus multiple qr plates, blower and other accessories. ?Love the rubberized handles, the slide out handle is smooth and solid, wheels roll smoothly. ?Laptop fits naively in sleeve, but zippered pockets are pretty tight and will hold minimal accessories. Stoked with this purchase over the Pelican 1510SC. Rated 5 out of 5 by Ron from Rock solid protection I initially purchased this case when it was suggested that the TSA would disallow personal electronics larger than a smartphone, including cameras, in cabin carry-on luggage. I wanted something strong and secure to protect my cameras and lenses in the evenmt that they had to be checked. The SKB case with the ThinkTank inserts is perfect for such a mission. Although the TSA did not act on this possibility, I have been using the SKB case for a couple of weeks and can say that it's pretty much bomb-proof. The only downside is that it weighs over 12 pounds empty. Rated 5 out of 5 by Instructor from Well Built Protection for Photo Gear This case is built like a tank.? Dividers and top are very well designed.? It provides rugged protection for my cameras, laptop, and lenses.? Would definitely buy it again.? It is a better value over Pelican cases and has a lifetime warranty. Rated 5 out of 5 by Mark from The perfect case for all my Edelkrone gear... I've been looking for a rolling case that will hold all my Edelkrone gear: SliderPlus, Target and Action Modules, vertical arm adapter, FlexTilt head, plus batteries and cables. This case is the perfect solution. Everything fits snugly, the lid organizer lets me see all the cables and batteries, and there's plenty of extra room. I especially like that the handle mechanism only requires one hand to raise and lower. Great case! Rated 5 out of 5 by Merv from Perfect This case is perfect. Holds both my dslr's?with 4 lenses including my 70-200. The wheels and telescopic handle have saved my back. Solidly?built and worth every cent. Will this case fit the Sony nx5u comcorder? Hello Jian Unfortunately, from the dimensions found online it appears that the depth will be an issue so this case wouldn't fit. The depth seems like it might be a bit short. Will this hold full-sized DSLRs like the 1Dx and the 5Ds with battery grip? I have a Think Tank Airport Security and am always hassled by the gate agents. Does anyone know if this case will fit in an overhead luggage compartment, or is it too large as a carry on? According to spec from most airlines, yes it is approved size for a carry on. Is lid organizer in photo included? Yes lid organizer in included. Is the lid organizer included or is that and additional purchase? The pictures shows the lid organizer SONI assume this is included - yes/no ? what locking latch will work with this case? I have a 15 inch macbook pro- was wondering if it would be able to fit in the laptop pocket? My 15 inch MacBook Pro Laptop slips in nicely. Is this a TSA-approved overhead bin size (like the Pelican 1510 and 1535)? I already have issues with my over-stuffed Think Tank Airport Security bag.